This story has a happy ending. You know those herbs you find in the produce department of the grocery store? Some are in pots, some, like Basil, are in plastic bags of water, with the only the dirt around the roots? The herbs look so promising…and then I always overwater… and then the plants die. But I know you. No matter how many times you’ve failed at this, you still get excited when you see those herbs growing in the grocery store. You bring those containers home, set them up in the sunniest spot you can find, and dream of snipping off fresh herbs to add to pasta. Then, within nine days, maybe five, those green herbs are brown, gray and disgusting. I’ve been reading and studying, at length, about hydroponics. 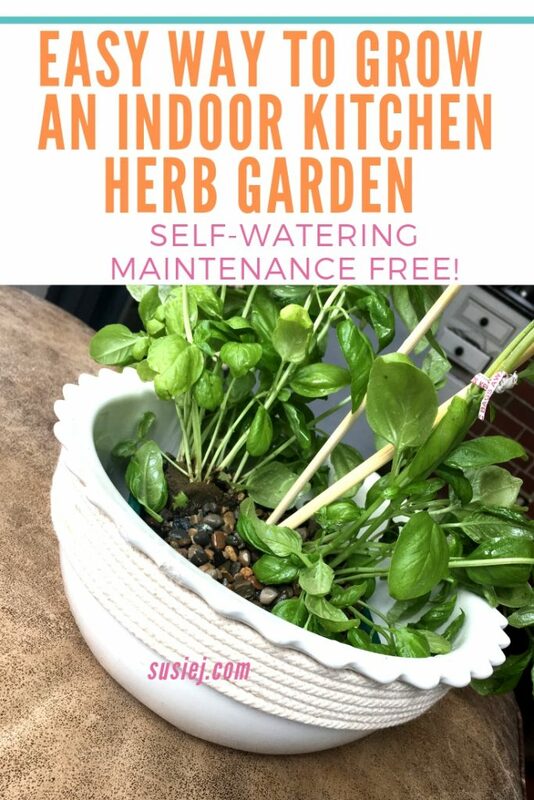 I love the idea of a no-soil, no-mess method of growing herbs, for the one reason of eliminating the bugs that often come with soil. And I always overwater and my roots rot. The basic idea of hydroponics is that plants need water, AIR AROUND THE ROOTS (this is very important) and nutrients. 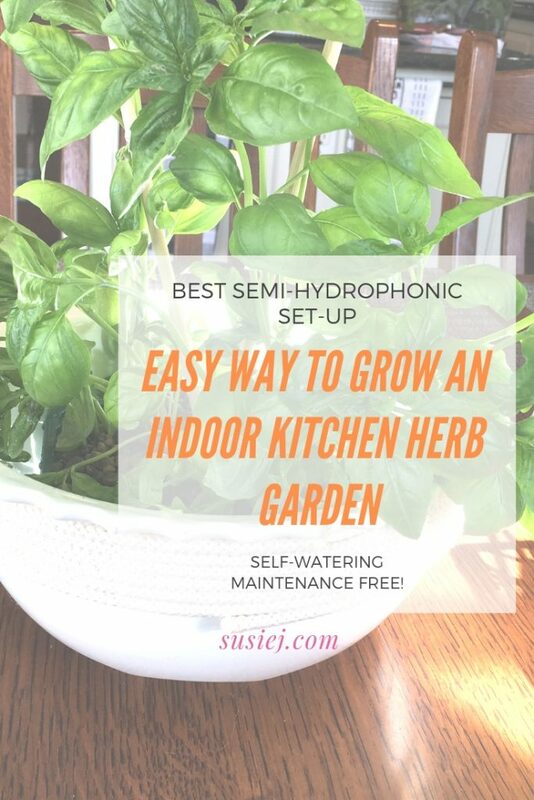 Many of these kits involve using an aerator, which you have to plug in, to move the water around to ensure the plants have good air circulation. Bernard Kratky, University of Hawai’i System, developed a non-circulating hydrophonic method, called semi-hydrophonics. This means no aerorator required. The trick is to use a growing medium that allows air to flow naturally. One way to do this is by using a growing medium that allows air flow — such as lava rock, pumice, hydrostoneor pea gravel — with a steady supply of water. There are many systems, variants of hydrophonics, aquaphonics, the Kratky method and semi-hydrophonics. Feel free to study them all. But for now, here’s a quick way to get that kitchen counter herb garden that you’ve always dreamed of. Here is my own personal variation of semi-hydrophonics. I think you’ll love it too, but feel free to learn and adjust your set-up to match your needs. A plastic container with holes in the bottom. Recycle a produce or deli package. If your container does not have holes, drill them — at least four holes. A non–pourous container/bowl that can hold your plant container and water. Slightly larger than your planting container so that your planting container fits inside. A third small bowl for your watering wick. Rocks: Small lava rocks, pumice stones or pea gravel — or hydrostone, the “holy grail” of substrates for hydro and aquaponics gurus. A $5 bag of lava rock, used for grills, at the hardware store, works perfectly fine. Pea gravel is nice because it helps to support tall lanky plants. Synthetic fabric or yarn of some kind, to serve as your wick, long enough to go through your container. Fill a separate small bowl with water, and add a splash of dishsoap to the water. Put your synthetic fabric or yarn in the bowl to soak while you get the plant ready. Remove your herbs from the packaging. If there is dirt on the bottom of the roots, soak them for at least 20 minutes in water, and then loosen the dirt. Does not have to be pristine… just do the best you can. Cut a piece of your soaking wick so that it is long enough to run across the bottom of the planting container, and up through one of the holes to reach the top of the container. Fill the bottom of your planting container with a small layer of gravel, lava rocks or stones. Place your freshly washed herb on top of the rocks, while you use your other hand to add more rocks to support your herbs. Be careful to keep the wick string high up inside the pot. Once you have filled the planting container with enough rocks to support your plant, place the container instead of the non-porous bowl. Ensure your “wick” string is still attached to the top of your planting container. Fill the non-porous bowl with water, and place your container in this “bowl of water,” ensuring there are no leaves from the plant that have fallen into the water. I used chopsticks to serve as plant stakes to keep the Basil upright. That’s it! Your herbs now have all the requirements they need: Light, water and air around the roots. Instead of watering every day, and risking overwatering, just fill up the reservoir, your non-porous bowl, with water to ensure the wick has enough water to keep the roots moist and check it every week or so. Herbs, unlike other plants, rarely need extra nutrients, and gather most of what they need from the sun. You can feed them with a liquid fertilizer (one that is designed for hydrophonics-set-ups) to encourage new growth.